When choosing fruit trees in North Carolina, select tree varieties that have adapted to the climactic conditions, exhibiting tolerance to dry soil and resistance to diseases and insects. Fruit trees are very attractive landscape additions. Their blossoms and foliage add color, height and interest to the landscape, they provide instant shade from the sun and their mature fruits are readily available to pick and eat. Cherry trees are a common tree selected to grow in many North Carolina landscapes. Cherry (Prunus avium) is a member of the Rosaceae, or rose, family. Cherry trees are perennial, non-native trees that grow throughout the eastern and western regions of North America. 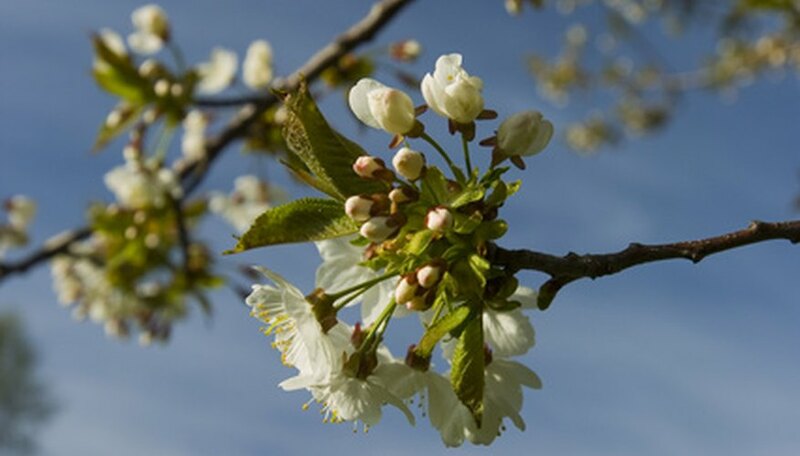 Prior to fruit development in the spring, the cherry tree produces small, five-petal white blossoms that cover the entire tree. In the fall, its leaves change color from green to shades of yellow, orange and red. Apple trees (Malus domestica) belong to the Rosaceae family. According to Michael L. Parker, extension horticultural specialist at North Carolina State University, some popular apple varieties grown in North Carolina include braeburn, empire, fuji, gala, golden delicious, jonagold, red delicious and rome. These trees grow in a variety of soil types as long as they are well-drained and nutrient-rich. Apple trees grow in the spring through summer, producing purple flowers that bloom in mid-spring. Apple trees grow to 30 feet in height in moist to semi-dry soil and full sun and produce apples from summer through fall. The sweet crab apple tree (Malus coronaria) also grows well in North Carolina. Also known as American crabapple, wild sweet crabapple and American crabapple, this perennial fruit tree is native to most of the eastern half of North America. According to the USDA, the sweet crab apple has an endangered status in New York state. Grow a few pear trees in your North Carolinian landscape. A perennial, non-native member of the Rosaceae family, common pear trees grow throughout most of the United States with the exception of a few Midwestern and western states. The common pear and other pear varieties grow well in the North Carolinian environment. Pear trees grow in the spring through the summer, and their white flowers bloom in early spring. Pear trees require moist soil and full sun. Pears form on the trees and ripen in the summer. According to Duke University, fig trees are common additions to North Carolinian landscapes since they thrive in hot climates that mimic their native Mediterranean origin. A member of the Maraca (mulberry or fig) family, the common fig (Focus carioca) is a perennial tree that grows to 30 feet high. The tree forms flowers followed by its fruits or droplets. A member of the Rosaceae, or rose, family, the peach tree (Prunus Persia) grows in the eastern, southern and several western portion of the United States. Its pinkish peach blossoms bloom in early spring, and its drupe, or fruit, grow after the blossoms and ripen in mid-summer. The peach tree grows up to 15 feet tall. A welcomed addition to many North Carolinian landscapes, the American plum (Prunus Americana) is a member of the Rosaceae family that grows throughout North America. Also known as wild plum, it grows up to 30 feet in height. Its white flowers bloom in early spring, followed by the formation of its drupe, or fruit that ripens by the end of summer.